RPE roll stocks are available in regular and fire retardant grades for general weather protection and hoarding. 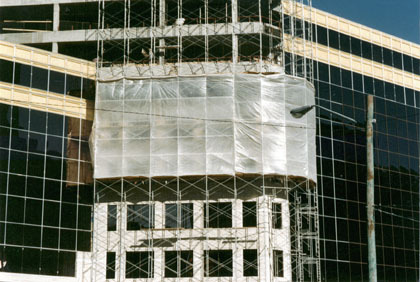 On larger construction and industrial projects, the general contractor often has an immediate requirement for weather protection or enclosure applications. To adequately service these situations Layfield stocks a complete product line of WeatherPro bulk dispenser rolls manufactured from high strength, lightweight, clear coated RPE®. In the case of Industrial or Petrochemical projects, where stringent fire code and safety requirements prevail, Layfield stocks fire retardant WeatherPro bulk dispenser rolls manufactured from FR-RPE®. Want to protect odd shaped objects and equipment? RPE®'s are economical lining materials for seepage control, soil remediation, and interim landfill cap applications.